There are some big questions hanging over smartwatches - do we need them?What are they for? How much should they cost? Pebble's 'thing' has always been to be helpful and stay out of your way and now, with the Pebble Time, it has a new Timeline UI that's already been copied by the Apple Watch. Is the new $199 Pebble the answer to the smartwatch question? It's one answer and an option worth considering for anyone looking to buy a smartwatch but Pebble is struggling to break away from its geeky origins. First things first, the Pebble looks better in real life than the pics you'll have seen online. The black model is a little boring but will look neat under suit sleeves - for the record, we prefer the red and black Time. Admittedly, the Time is plasticky, with a stainless steel bezel, but it retains the toy-like charm of the original Pebble while adding friendlier, more unisex curves. It's very light at just 42.5g including the standard strap, 20% thinner at 9.5mm and the new slightly curved body helps to make it comfortable to wear on the wrist. It's amazing how many smartwatch manufacturers are satisfied with making devices that sit flat on top. The Time is the kind of smartwatch you can forget you're wearing, until it vibrates. The bezels are wide and this does have the effect of making the screen look tiny - at 1.25 inches it's actually the same size as previous models. Still, the colour e-paper screen livens the Pebble's alerts up compared to the first one though it cleverly reverts to monochrome for boring settings and menus. The GameBoy Colour comparisons come easily - how you feel about that is a good indicator of how well you'll get on with the Pebble Time. It's quite dim though and even though there is a backlight it can be tricky to read - this is no bright and punchy Android Wear screen, put it that way. The four physical buttons remain and that's no bad thing - anyone who has worn a smartwatch for any period of time knows a reliable button press can be preferable to a swipe that might go astray. And we prefer these to the Steel's buttons, for instance. All round it's a practical package with water resistance down to 50m though we have noticed that the watch scratches rather easily. Any 22mm watch band will fit the Pebble Time, as before, and a new quick release mechanism (a pin that you slide) means that swapping from Pebble strap to Pebble strap takes just ten seconds. It's actually really fool-proof. Smartstraps with added functions or battery haven't materialised yet but there is a $1m fund for them so these could be the making of Pebble six or twelve months down the line. We had high hopes for Pebble's new OS, especially the Timeline feature, and as we mentioned earlier Apple appears enamoured with the idea since it will soon appear as Time Travel on the Watch. Does it live up to the hype? There are currently only 13 Timeline ready apps in the Pebble app store but you can begin to see the potential here - downloads like Swarm by Foursquare, fitness and sleep app Morpheuz, and Battery+ battery manager can all push alerts to your upcoming Timeline. There's still a watch face screen, don't worry, but you can then press the middle button to access the 'present' info like your music player, weather etc. Otherwise, pressing the lower button takes you scrolling back up to 24 hours in the past whereas clicking the top button scrolls up to 48 hours in the future. Yes, it's largely calendar items for now so it's not quite the gamechanger we were hoping for but it could get there. Each 'card' on the Timeline has a geeky icon, like a clock, and colour background too. It's not pulling in search and location info like Google Now so it's not as suggestive in knowing what you want to see. But there are some clever elements - notifications will still pop up on screen when they are pushed from your smartphone but these can be managed to be in Timeline, as alerts or both. You can set certain apps or functions to a long press of one of the buttons such as music. Music controls include play/pause and skip and can be set to work with Play Music, Spotify etc but don't reliably show the title of the track you're playing onscreen which is annoying. For skipping between Spotify playlists, you'll have to go third party. It's worth remembering too that the Pebble Time is iPhone and Android compatible. The new addition of voice replies will only work with Gmail on iPhone versus a whole bunch of apps on Android. It works surprisingly well with responses to WhatsApp and Facebook messages detected mostly accurately but you don't get much time to speak after it says 'Listening' onscreen. This is for short snippets of dictation only. One benefit of the new colour e-paper screen is fresh watch faces with everything from a classy Mondrian style face to Donkey Kong available to adorn your smartwatch. Pebble has also removed the limit for the number of watch faces and apps so you can add a bunch to the Pebble iOS or Android app to swap in and out. 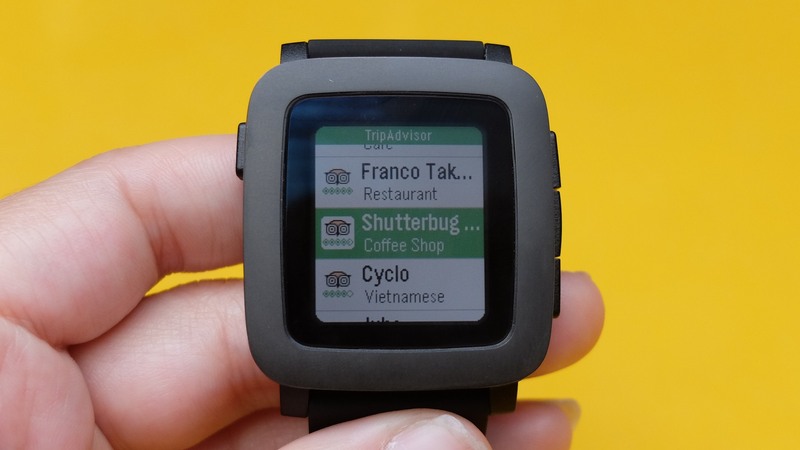 All the old apps, more than 6,500 of them, will work on the new Pebble Time watches even if they're not in colour. Which is good and a smattering of big names such as TripAdvisor's tidy app for finding nearby restaurants and attractions have made the effort to upgrade. There's a lot of tat still though and the quality of the apps compatible with the Apple Watch and Android Wear does put Pebble's roster to shame a little. The Time also suffers from the limitations - it won't display images or Vines, for instance, which the Apple Watch can. Part of the reply options include templates (fine) and emojis but these aren't rendered clearly enough to be able to distinguish the faces without really squinting at the watch. Devs won't get into the Pebble game to make beautiful apps then. If you're interested in fitness, it's worth updating your Pebble Time app and giving Pebble Health a go. Otherwise, Misfit supports Pebble and Jawbone's UP platform does too though it is classed as a watch face not an app. If you use Android and have another wearable for running, say, you could also use PlexFit which has Google Fit compatibility so everything will be in one place including steps from Pebble. There's no extra sensors such as heart rate monitoring but the third party VU Pulse case adds this functionality. The newest addition to Pebble's features list is Pebble Health which brings native activity and sleep tracking to the Pebble Time, Time Steel and Time Round. Head to our beginner's guide to Pebble Health for how to get going and how we got on with the new platform. It's worth enabling Pebble Health and giving it a go as it's a simple, easy to use tracking app and it shouldn't impact battery life too much (5 - 10%). The sleep tracking, in particular, is impressively accurate. Plus you get glanceable yellow lines on bar charts indicating how many steps you've usually done by this time of day. Very clever and it could motivate you to move more. You view everything over four screens in the Health app on the watch itself, with automatic pins to your Timeline for sleep and activity summaries once a day. So there's nothing within the Pebble Time apps, except settings, but you can hook Pebble Health up to Apple Health or Google Fit for weekly and monthly graphs. The promised still-seven day battery life is probably a big reason you're interested in the Pebble Time. We didn't quite get seven days out of it on iPhone or Android. The best we managed was 5/6 days but, to be fair, when reviewing and adding new apps you're likely to perhaps hammer a smartwatch a bit more than usual. It charges very quickly via a proprietary cable which secures to the pins on the back of the watch more easily than previous Pebbles, a plus point which means you won't think it's charging when it's not. Ultimately we'd like a dock but for now this works. The battery life is definitely a reason to choose the Pebble Time over Android Wear watches and - if you're interested in using Misfit or Jawbone on Pebble - even some fitness trackers. In fact, that stamina changes the way you use the smartwatch - yes, you can have all your alerts on it, yes you can play games like Pixel Miner without worrying about a blank screen. We're just not sure colour e-paper will satisfy us long term and if you think it will, it might be worth waiting for the Pebble Time Steel which has a longer, 'up to' ten day battery life. Ah, Pebble Time. It's a geek chic grower that will fit into your life if you're willing to overlook some shortcomings. It's comfortable, reliable and works with both iOS and Android so you can commit. Timeline is useful and can only get better, Pebble Health turns it into a basic tracker. Voice works. Colour e-paper livens things up a bit and doesn't seem to impact battery life. But it's not quite the answer to the smartwatch question. Now we've seen Now's AI skills on Android Wear and real world partnerships with the Apple Watch, Pebble's combination of keeping things simple and geek-friendly might not be enough for everyone interested in owning a smartwatch in 2015. Plus, don't forget the more premium and longer-lasting Time Steel if the Pebble is on your shortlist.